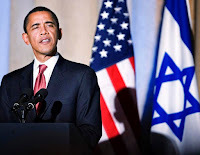 If you read the American media in the last week (left, right, or in the middle), you would have heard all sorts of outrageous claims about the current state of US/Israel relations that ranged from President Obama and Gen. Petreus being anti-semitic to Obama trying to start a new intifada in Israel. Or you might have read that the Obama Administration "attacked" or was "uncharitable" toward our ally in Israel. Or maybe you heard that President Obama was hated in the state of Israel. None of these claims are even remotely true. The truth is, that while there was a minor diplomatic hiccup last week while Vice President Biden was visiting Israel, and the US has accused the Netanyahu government of violating agreements made with the Bush Administration regarding expanded settlements in the West Bank, the Israeli population does not view President Obama unfavorably, nor do they think he is anti-Israel or anti-semitic. This view is reflected in a brand new Ha'aretz poll conducted Tuesday and Wednesday of this week. One needs to remember that in the US, we are presented with pretty much only one side to the Israeli-Palestinian issue, and US public opinion reflects that. In certain circles (the right wing blogosphere and Fox News), disagreeing with the Israeli government automatically makes one "anti-Israel" or even anti-semitic. In Israel, however, public opinion is deeply divided on the question of the West Bank and Gaza, and the creation of an independent Palestinian state. If you only listened to the American media, you would have a false impression of the views of average Israelis. In the same poll, 64% of Israelis said the Netanyahu government's policies "do not represent" their wishes. Keep this in mind next time you read something about Israeli's "hating" President Obama, or if you read that Obama's Israel policy is some radical departure from the US norm. It ain't true. Good! Then if Israel's approval opinions of Obama is favorable let him be THEIR president. I would gladly trade him for Netanyahu. Besides, the most recent poll released yesterday showed Obama now has a 1% UN-favorable rating in the United States. 1% unfavorable? So, that's 99% favorable. Not sure that sounds right, but I'll take it. In reality, however, Obama's poll numbers have consistently been around 50%. Considering the full-on assault the Republicabagger party has had on everything he has done, I'd say that is quite good. Bush never broke 32% from late 2005 until he left office. Kinda kills the right wing talking point that Americans don't support President Obama. I apologize for not being clear in my stats. He has a 47% disapproval versus a 46% approval rating. (A net negative of 1%). This has been seen in two polls as of yesterday and today now. Obama is dropping fast at this stage in his presidency. Care to make a wager that his approval ratings are lower than Bush's by the time Obama leaves office in 2012? Not sure that Fox News is interpreting the polling data correctly that they are feeding you. Every major poll I have seen, show's Obama's personal approval hovering around 50% - usually higher. And as conservatives were fond of saying when Bush was in office, polls don't matter. The only poll that does is on election day. And with the super weak bench you guys are pulling from to run in 2012, I'm not sure you'll like the results of the poll in November 2012.